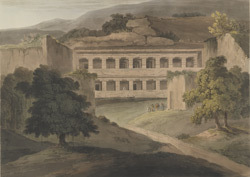 Plate 21 of 'Hindoo Excavations in the Mountain of Ellora near Aurangabad,' engraved by Thomas Daniell after the drawings of his deceased friend James Wales, which Daniell regarded as the sixth set of his 'Oriental Scenery.' Do-Thal or 'two-storeyed' as this cave was called when it was discovered in 1876 consists of a broad forecourt with superimposed halls extending deep into the cliff. The pillars are square and have simple brackets capitals. The shrines have seated Buddhas but some carvings depicting Durga and Ganesa indicate that this Buddhist cave was later converted to Hindu worship. Archaeological excavations have since revealed that the complex has three stories, not two.